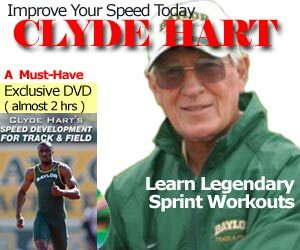 Usain Bolt Speed Reserve vs. Michael Johnson Speed Endurance? With all the hype about Usain Bolt’s 10 meter splits and speculation on what he could have run, I forgot to analyze the 200 meters! Shame on me! I touched the topic of Speed Reserve in Part 1 and Part 2. Usian Bolt’s 200m splits were clocked at 9.98 + 9.32 splits for his 200m. Compared to Michael Johnson’s 19.32 from the 1996 Atlanta Olympics, his splits were 10.12 + 9.20, so Johnson actually ran a faster second half. The USATF supplied this photo taken from the stands and edited using Dartfish. The start of the race was recorded by using the smoke from the starting gun. Usain Bolt’s theoretical 9.0 seconds (rounded up) for 100 meters “on the fly” is pretty accurate considering his 3rd leg 4×100 meter relay split two days later at the same Olympics on the curve was also 8.98 seconds. Lead-off man Nesta Carter ran 10.41 & Michael Frater’s split was 9.01. This is considerably slower than Asafa Powell’s 8.7 “World best” relay leg. Before I get flamed, you can’t compare apples and oranges, or rather, the 3rd leg vs. the 4th leg, curve vs. straight, one hand-off vs. 2 baton exchanges, and so on. Michael Johnson’s PB is 10.09, so his speed reserve was 10.12 – 10.09 = 0.03, or pretty close to his best 100.
Who is King of the 200 meters? Usain Bolt or Michael Johnson? Based on numbers and splits, is it fair to say Usain Bolt executed the race with a better Speed Reserve, but Michael Johnson has better Speed Endurance? Was Usain Bolt’s approach to the 200m better than Michael Johnson’s? I’ll let you decide. Even a 9.65 doubled = 19.30 +/- 0.2 seconds gives you a range of 19.10 to 19.50. 1910… Nineteen-Ten… Geez, that’s not a 200 meter time, that’s the year Mexico celebrated its centennial of the Independence War! that speed reserve number for johnson is clearly incorrect, he ran the atlanta track out of lane 3…overcoming the turn slowed him more than for bolt who ran out of lane 5. For bolt it was 1 stride if I counted correctly…his first 1/2 of the 200 was covered in 42 strides vs 41 for his 100m WR. Johnson would run turns better than most due to his naturally short strides (especially when compared to bolt who has naturally long strides). but…we’re working with limited information as johnson’s one season of 100’s clearly didn’t give us enough data. @Jet – yes, MJ 10.09 is a single race on one season. So who knows how fast he could be if he focused on that event? iaaf.org published the biomechanical numbers, bolts 50m on a curve was 5.60s, 100m was 9.92s (6/100th faster than the beijing run), 14.44s @ the 150m. The 2nd 100m run in 9.27s vs a beijing run of 9.32s. adjusting for reaction time it seems like both races were very consistent. Both races were run outta lane 5. I think from a pure speed standpoint.. Usain is much faster and has the record. But for Johnson to showcase “endurance” in a 200m race is basically unheard of. Everyone thinks of the 200 as a pure speed, no endurance. You think that if you run the first 100m then you can carry 95% of your speed through the race and run a faster 2nd part. MJ showed this and no one has been able to top it. Usain has insane speed and if he can work on his endurance.. then he could potentially break the 19 second barrier. It will not be as easy for him as breaking the current 100/200 were he will have to work twice as hard as he has been working. If he is to break the 200m further, I think we will see him running some 400meter runs in the near future, which will be interesting! The 2nd half of yesterday nights run in berlin corrects to 9.256s. 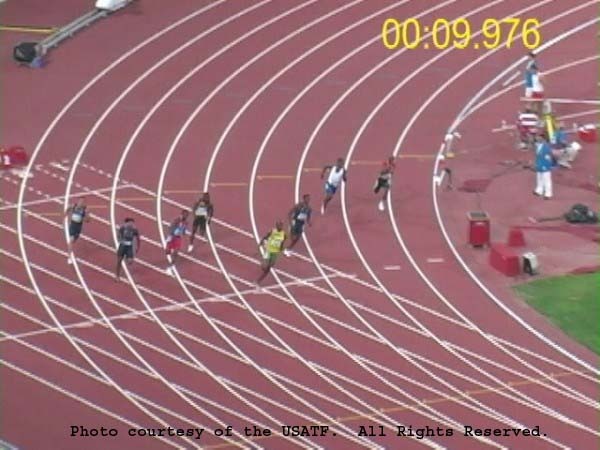 Essentially bolts berlin 2nd half corrected is merely 3/100ths of a second (0.029s) slower than MJ’s atlanta run. This analysis is subject to enough error to be caution when extrapolating information. As the straight aways is just over 80m and not 100m, we don’t know what the cross wind was etc. I think some of these figures are overly analyzed. Which place has cleaner air, Bejing, Altanta, Berlin? I mean all that has to do with how much oxygen people get while breathing etc. But if your going to correct the 2nd 100meters, then correct the first 100 meters also. That means MJ ran a 10.2ish first 100meters. Anyway you look at it.. his second 100meters was a full second faster than his first. Whether he reserved speed.. or he just MAINTAINED speed is 2 different things. It looks more like Usain went all out.. and tried to continue but was running out of gas. While MJ looks like he ran 100% and could do it for another 50 meters. Either way both are great examples of heart and determination. I remember in HS racing the 400m kids at 800m (I was a natural1/2miler). I was consistently running like 55/56’s in the quarter and wasn’t close to their high 49’s / low 50’s. The 800 was always a great race to challenge each other. Wish there was a 600m race to make things really interesting. I would have liked to have seen Donovan Bailey (in his prime)/ Usain Bolt 150 meter race. I hated that the previous MJ / DB race didn’t work out. can’t really correct for the curve 100m, i got no wind information. Mureika’s page explicitly mentions that limitation. you can correct for density altitude, elevation & humidity. Those affect the results but the big wild card is wind; that does more to affect a race time than any other factor. – Michael Johnson had already won the 400M dash at that same olympics, as any of us who have run the 200/400 can attest – having to run multiple rounds of the 400m, some on the same day as the 200M is GRUELING. There was no way Michael was as fresh as Usain was from running the 100M. – Also Michael pulled a quad during the 200M dash if you watch tape of the race his stride sorta breaks down for a split second and he was clearly limping after he crossed the finish line. SO if he had been fresh, if he hadn’t injured himself (I’m sure his schedule had something to do with it) he might still have the record. The final factor is that training for the 200m/400m double is complementary and counter-productive at the same time, if he was specializing in the 200m he might’ve been even faster. That has to be the most ridiculous reasoning I’ve ever heard of. If you’re going to use rounds as an excuse why one runner is better than another, then you need to also include the fact that Bolt took an entire month off 200m training that year because of the MVA/foot injury. I see your 400m rounds and raise you a foot injury and lack of proper training. Nothing tops that. Just watch the Johnson race from the start….Johnson had the worst start and his accel phase technically is no way near as efficient as it could be..he just stands up and runs! Just like Ben Johnson. If these guys had the techniques of now days, you WOULD see faster times.STILL though…..Usian is a freeeaakk and i believe would still be the fastest. Usain’s speed maintenance will come with training that emphasis’s it…which he hasn’t really needed to do to win nowadays. Tysons 400 is better than Usain’s because he must have done heaps of volume in the off season and his 200 looked great..until he broke down. MJ volume for 400 has given him the edge for the second 100. Would love to see Usain do 400m training for a few months….then see the 200m WR lower far more! @Ian – yes, MJ stumbled out of the blocks on his 3rd step. And he still ran 19.32! I’ll take speed endurance anyday over speed reserve. I imagine MJ had some serious speed reserve also though, I mean you can’t be a 10.0 100 guy and run that the first 100. To me it also shows MJ was in better shape to be so close to his 100m max in the first 100 of his 200m. Bolt just has god given gifts (length and stride rate and stride length). If MJ was blessed with that with his speed endurance ability I would love to see how fast he could go. All that I can tell u all now is that Bolt ‘s record is still the best ,no matter any analysis that anybody want to give.Bolt my guy ! ride on please. U are d king of track now even better record than your predecessors.Enjoy your reign. Yohan Blake! i wonder what his numbers were…but subtracting the shittiest start anyone has ever seen for such a run…Blake’s numbers were clearly superior to both WR run’s Bolt made. If Yohan Blake had a better reaction time on his 19.26 200m (it was 0.269 where his 100m reaction time was 0.174 in Daegu), he would have broken the world record with a 19.17 WR. Is it truly possible to run you second 100m faster than your first 100m? Michael Johnson’s splits despite the stumble on the third step shows that with speed endurance it is possible. If Usain had ever buckled down and trained properly in the 400m, we would have seen a sub 19. No question. Keep his 9.5 speed but increase his endurance as well. Interesting article but then Bolt never runs to full ability when he has the race in the bag. Clearly his overall approach is better than Johnson’s as he is so much faster. I wouldnt mind betting that in a fictional head to head Johnson’s speed would push Bolt to run that second half even faster. On Bolt generally, I actually think the reason he is so good at sprints is that he is a whole generation ahead of the field. In fact it is possible that the person who breaks these records (as they will in time) might not even be beyond the crawling stage yet! Excellent take. If only these two had raced at the same. There probably would have been a new WR at every championships. Usain, unlike other athletes, needs that push. If there isn’t a reason for him to do more and go faster he won’t bother. MJ only cared about pushing himself. But Bolt would have still made him go even further. If they had been in the same generation we probably would have had a sub 19 by now. Excellent take. Without doubt,Usain Bolt is way faster and has greater speed reserve than Michael Johnson.But MJ had far greater endurance.I don’t find it useful to wish that if MJ was as genetically gifted as Bolt,in height sense,he would have run faster.Everything happens for a reason.Probably,had MJ been taller I’m sure his stride frequency would have been less rapid and stride length longer. That explains Bolt’s inferior speed endurance,when compared to MJ.The longer the stride,the greater the energy used,the quicker you tire.MJ had a short and efficient stride that enabled him to maintain his top speed for longer. I like Bolt,but I hardly think any 400m training will lead to him lowering the 200m mark.Endurance is not really his strong point,and I don’t see him ever improving on it more than he already has.